7:27pm: The signing is now official, with the Braves announcing it. 1:35pm: The Braves have reportedly made the largest free-agent strike of the offseason so far, agreeing to terms on a one-year contract with former American League MVP Josh Donaldson. The contract is said to guarantee Donaldson the same $23MM salary he earned in 2018 and will give the MVP Sports client an opportunity to re-enter free agency next winter — hopefully on the heels of a healthier, more productive season than the injury-ruined 2018 campaign through which he just struggled. Donaldson, 33 in December, was limited to just 219 plate appearances this year as he battled a shoulder issue early in the season and a calf injury that cost him roughly three months of action. He posted a solid but unspectacular .246/.352/.449 batting line and eight homers when healthy — above-average production relative to the rest of the league but a tremendously far cry from the composite .282/.377/.524 batting line he logged from 2013-17. If healthy, Donaldson will give an already imposing Braves lineup a massive boost — to say nothing of top-shelf defense at the hot corner. Atlanta already had premium glovework at third base thanks to Johan Camargo, but the Braves will now have the luxury to deploy Camargo at a number of positions. Camargo, soon to turn 25, can give the Braves some cover at third base, shortstop and second base at the very least. Speculatively speaking, it wouldn’t be a surprise to see Atlanta try him in the outfield corners during Spring Training as well; if Camargo proved capable, the Braves could deploy him in a Marwin Gonzalez or Ben Zobrist-esque fashion, granting him fairly regular at-bats while spelling Donaldson, Dansby Swanson and Ozzie Albies, among others. The signing of Donaldson could push back the debut of prospect Austin Riley by nearly a full year, but Riley is still just 21 years old and has only played 150 games above Class-A Advanced. Some additional development time certainly won’t hurt — especially when considering his 29.5 percent strikeout rate in Triple-A last season. The $23MM salary, combined with the reported $2MM salary the Braves will pay fellow free-agent addition Brian McCann, will push Atlanta’s Opening Day payroll projection to just north of $117MM. That’s already just about $1MM shy of their 2018 mark and $5MM shy of the all-time franchise record, so it seems apparent that the Braves’ NL East title and emerging core have spurred ownership to become more aggressive in terms of payroll. By adding Donaldson to the heart of a lineup that also features Rookie of the Year Ronald Acuna and perennial MVP candidate Freddie Freeman, the Braves have made an early splash that’ll have significant ramifications on the 2019 division race and put additional pressure on rivals like the Phillies, Nationals and Mets to further act to bolster their rosters as they seek to remain competitive in a rapidly improving division. Steve Phillips of MLB Network Radio on SiriusXM first tweeted that the two sides were nearing a deal. Ken Rosenthal of The Athletic reported the agreement and the terms. The Indians announced the completion of the August 31st Josh Donaldson trade today, sending right-hander Julian Merryweather to Toronto as expected. To make room for Merryweather on the 40-man roster, Jon Berti was designated for assignment, per Sportsnet.ca’s Shi Davidi. The 28-year-old Berti got his first taste of the big leagues this season, starting four games at second base and hitting .267 for the Blue Jays in September. 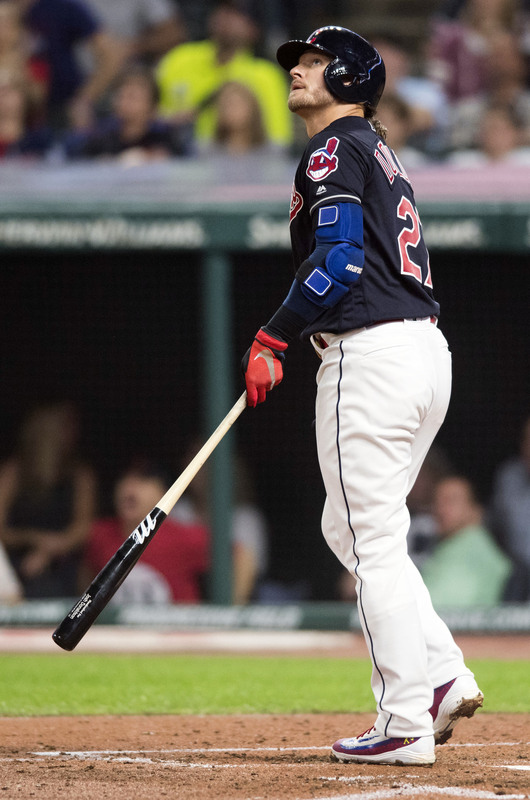 Playoff contributions notwithstanding, we now know Cleveland’s return on this deal – Donaldson’s small-sample September batting line of .280/.400/.520 across 16 games was good for 0.7 rWAR and a stellar 146 OPS+. With the division locked up for most of the season, Donaldson’s acquisition was designed for the playoffs, beginning today in Houston – still, they seem to have gotten a fair imitation of the bat they were hoping for thus far. Fancred’s Jon Heyman reported last month that Merryweather would be the PTBNL, but at the time the right-hander wasn’t healthy enough to be passed through waivers – having undergone Tommy John surgery in Spring Training. Merryweather missed the entire 2018 season, but because he was on the minor-league disabled list, he has yet to accrue any MLB service time. The Blue Jays are banking on Merryweather being more valuable than the compensatory draft pick they would have received if they issued – and Donaldson rejected – a qualifying offer. Perhaps they were wary of Donaldson accepting, which we now know would cost them $17.9 MM for 2019, but whether their thinking was financial, evaluative, or simply in the interest of keeping third-base unoccupied for uberprospect Vlad Guerrero Jr., the return for the 2015 AL MVP now hinges on the health and continued development of Merryweather. Before losing the 2018 season to Tommy John, the 6’4″ right-hander was 17th on Baseball America’s list of Cleveland prospects. He’s on the older side for a player yet to make his MLB debut (he’ll turn 27 on October 14th), but he pitched well enough in AA as a 25-year-old to turn some heads, and he has an arsenal that could play up to the level of a mid-rotation starter, per Eric Longenhagen of Fangraphs. Merryweather may end up in the bullpen, but remember, a rising tide lifts all boats, and the past few Octobers have done nothing if not raise the value of tweener bullpen arms like Merryweather. It’s not a flashy return, but six to seven years of a control for a near Major League-ready arm is nothing to scoff at. There’s health and development that need to break in Merryweather’s favor, but a supplemental draft pick was no less risky and ultimately, Toronto adds a controllable arm in exchange for an injured player on his way out of town. That undersells Donaldson’s impact in Toronto (as well as his abilities on the field), not to mention what they might have netted if they’d moved him last offseason – but if you squint hard enough, Merryweather’s upside at least hints at the possibility that Donaldson’s free agency isn’t a total loss. Josh Donaldson’s difficult season and recent trade have prompted plenty of looks in the rearview mirror to imagine what might have been. Now with the Indians for the tail end of an injury-plagued year, the veteran third bagger could instead have inked a long-term deal to stay in Toronto or been shipped elsewhere. Multiple organizations reputedly sought to acquire Donaldson from the Blue Jays before the start of the season. Reports at the time pegged the Cardinals as a major pursuer, and Bob Nightengale of USA Today now reports on Twitter that the club was indeed serious about landing Donaldson. While he had only one year of contract control remaining, and a hefty $23MM salary, the St. Louis organization was evidently not shy about giving up significant talent to make a deal. Indeed, per the report, the Cards offered up a two-player package that included young righty Jack Flaherty — the same hurler who might well be cruising to a National League Rookie-of-the-Year award were it not for the brilliance of two historic young hitters. Flaherty’s ongoing ability to suppress base hits — he’s allowing only a .248 BABIP — may reasonably be questioned. But his 132 1/3-inning showing (to this point) has been amply impressive even if it comes with some batted-ball fortune. Unquestionably, the Jays would take a do-over on their decision not to accept that offer. But that’s based as much or more on the ensuing injuries to Donaldson as it is Flahrty’s emergence. And if we’re going to consider what-if’s, there’s another entire scenario that also could have occurred. In this case, the outcomes favor the Toronto ballclub. It has long been known that the Blue Jays explored the possibility of an extension with Donaldson in advance of the 2018 season. Details, though, have not only been slow to emerge, but have come with no small amount of controversy. Today, Jon Heyman of Fancred fired the latest shot in an ongoing back-and-forth with Donaldson’s agents regarding pre-2018 extension talks with the Blue Jays. Heyman argues that “the Jays and the Donaldson camp knew exactly where they stood” in terms of contract price last spring, citing some of the player’s own comments to support his reporting. And, he insists, the Blue Jays made clear they’d be willing to pay something at or over the three-year, $75MM level to make a deal, if not a bit more. Those interested in the topic will want to read all the materials and reach their own conclusions. Broadly, the post mortem on the end of Donaldson’s tenure in Toronto is interesting for a variety of reasons. But it’s clearly also not a subject that necessarily needs to feature winners and losers. Certainly, there was no known reason to think that Donaldson was headed for such a calamitous season — either for the Blue Jays or the player’s reps. Historians may debate the facts, but they won’t likely dispute that the player was warranted in seeking a massive payday and that the club was justified in demanding a big return via trade. In any event, for the Indians the focus now is solely on what Donaldson can do on the field. He broke through with a home run today, a promising sign for the club as it seeks to get him up to full speed in advance of the postseason. When the season ends, the veteran will be able to choose his next uniform for himself. The Indians announced their plans regarding recently acquired third baseman Josh Donaldson today, as MLB.com’s Jordan Bastian was among those to cover (Twitter link). He’ll return to the active roster tomorrow and make his debut with his new new organization. Donaldson, of course, has missed much of the season and only began a rehab assignment for a calf injury in late August. The Indians nevertheless struck a deal to acquire him from the Blue Jays just before the deadline to add postseason-eligible players from outside the organization. Shortly thereafter, he returned to the DL for some additional rehab work, a delicate dance that had some other organizations expressing skepticism. The 32-year-old Donaldson is a pure rental piece for the Cleveland organization, which has already stamped its ticket to the postseason as a practical matter. In other words, the entirety of the transaction was about getting Donaldson up to full speed by the time the calendar flips to October. As it turns out, the veteran third baseman with have an 18-game stretch of major-league playing time before he’s tasked with performing under the game’s brightest lights. The immediate plan is to put him in the lineup on Tuesday and then give him a bench spot the next game before bringing him back to the starting lineup on Friday. How things go from there remains to be seen. Unsurprisingly, the Indians also say they’ll use Donaldson at his accustomed hot corner. That means that star Jose Ramirez will move to second base, bumping Jason Kipnis into the center field mix. The expectation, per Francona, is that this will be a permanent positional shift (at least, that is, for the remainder of the season). It all seems to be lining up nicely for the Indians, who may well have added a superstar-level performer to their lineup at a relative pittance of a price. Of course, that assumes that the fiery veteran is able not only to stay healthy but also to return to his once-lofty performance levels, which had trended down somewhat earlier in the year. He has certainly given every sign of life possible in his brief minor-league action. In 15 rehab plate appearances, Donaldson is hitting a cool .417/.533/.917 with two dingers, three walks, and nary a strikeout. In other news out of Cleveland, righty Trevor Bauer — another key rehabbing player — may be ready to throw a bullpen session on Wednesday. (Also via Bastian, on Twitter.) That could put him on track to be ready to go by the time the postseason gets underway, in a relief role at least, but it’s still a tight window.